"Synapse Films breathes new life into a forgotten cult classic"
When Synapse films announced they would be releasing this on Blu-Ray, it was a fresh reminder that I really needed to revisit this early 90's classic. While a lot of these little-seen or undiscovered and forgotten horror gems are finally finding their audiences through wide releases on Blu-Ray, that wasn't the case during their initial theatrical or home video releases. In fact, it's quite the opposite. But the internet was also in it's infancy, and not yet the free marketing tool we have today. What's more, all of these releases are usually big news leading up to the date because of savage collectors, social media and the internet. The releases themselves are done to the nine's, with new artwork, a fresh restoration of the original transfer, and a host of goodies for die-hard fans to dig through. Comparatively, these old cult classics are getting more of a push on Blu-Ray today compared to the marketing and promotion done during their original theatrical or home video debuts. In this new age of digital marketing, restorations and releases, Synapse Films is one of the leading brands spearheading the movement. 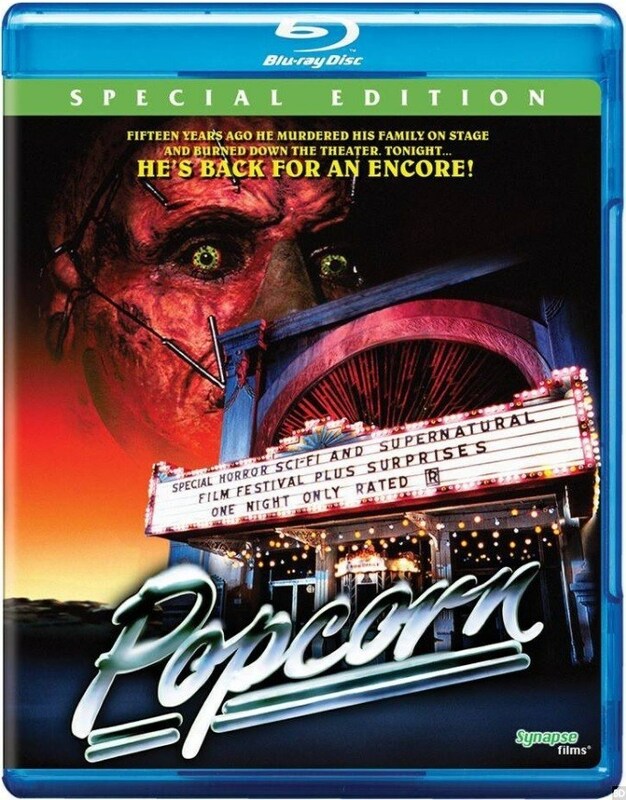 Which brings me to Popcorn, a 1991 horror film that literally seemed to come and go with very little attention upon it's original theatrical release. I can confirm that in my little hometown in South Texas, it didn't even make it into theaters, instead going straight to home video months later, which is where I would ultimately discover it. And I recall enjoying it, but never really revisiting it for some reason. 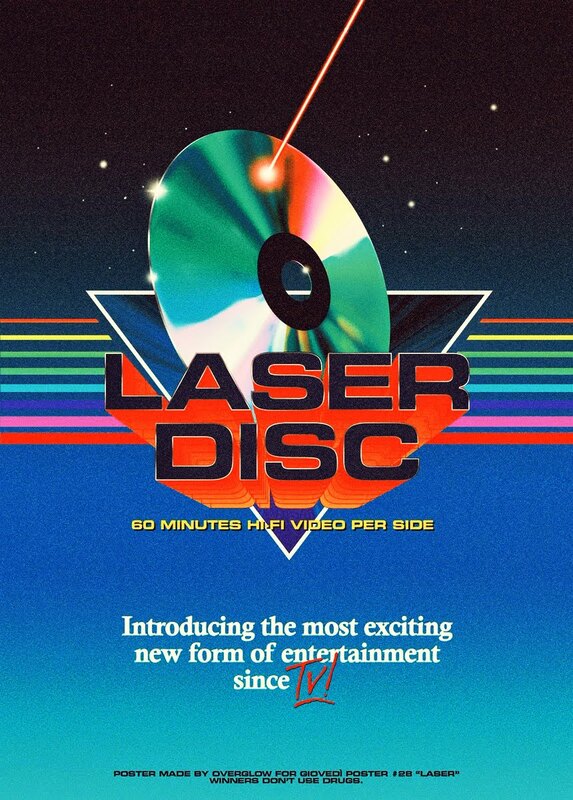 Flash forward to 2017 and Synapse Films announcement that they would be giving this forgotten classic the HD makeover for the very first time in a Limited Edition to 3,000 copies DVD/Blu-Ray Steelbook. While I remember people complaining about the steep $40 price tag, they still snatched it up in droves. 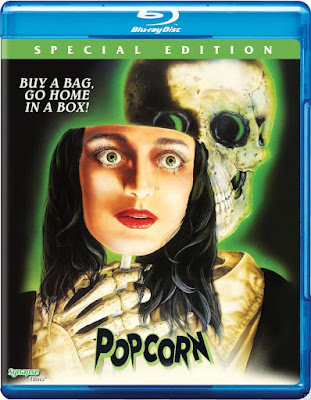 It sold so well in fact that Synapse decided to release it again, this time in a standard Special Edition Blu-Ray this past October for a much cheaper $20, which would contain all of the special features included in that original Steelbook release. Once I saw this cheaper release, I immediately jumped on the bandwagon and grabbed myself a copy. So let's dig in. When film students put together a Horror-thon in an abandoned movie theater, they discover a lost and mysterious film called "The Possessor", made by a madman who ultimately killed his entire family at that same theater years earlier. Maggie (Jill Schoelen) has been having nightmares that seem to connect her to the killer and this film and soon the classmates begin getting killed one by one during the Horror-thon. Will Maggie figure out who this killer is in time to stop them from killing everyone? To say I enjoyed this would be an understatement. I absolutely loved it and I'm shocked I never made the effort to revisit this earlier. There's just such a fun vibe and tone to the entire thing and despite having so many odds stacked against it, it ultimately delivers nonstop entertainment from beginning to end. It's a classy horror film, made with a deft touch and care that you rarely ever saw in films like this to begin with. Throw in the fact that it's also a loving homage/love-letter to the classic campy horror films of the 50's with a better-than-you'd-expect cast and you're in for a great time. Behind the scenes was a totally different story though, and the fact that the movie turned out as great as it did is quite frankly, astonishing. For starters, they fired their original lead actress Amy O'Neill with Jill Schoelen (The Stepfather, Phantom of the Opera) 3 weeks into production, as well as replacing original writer and director Alan Ormsby (Cat People, The Substitute) with Porky's actor Mark Herrier, who would make Popcorn his only directing credit. Though the film kept all of Ormsby's work with the films within the film, there's much debate as to how much he contributed to the rest of the film and how much of it's success goes to first time director Mark Herrier. Also of special note is that though you'd never guess it, Popcorn was shot entirely in Jamaica (Huh??). I'm telling you, the film's production was pretty much chaos from the beginning, though you'd never know it. Which brings me to my next point. 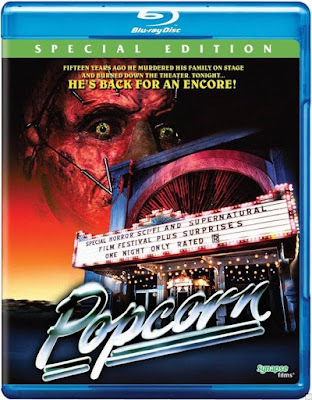 This excellent release also comes with a full-length documentary "Midnight Madness: The Making of Popcorn", which digs deep into the films troubled production offering new insight into the chaos, with new interviews from the cast and crew. There was even controversy regarding it's original poster design for Pete's sake! Honestly, this documentary alone is worth the price of this release and all the startling revelations will leave you dumbfounded. The cast of Popcorn is nothing short of exceptional, starting with the legendary Dee Wallace, who I feel like has been popping up in so many random films I've seen lately both new and old. And while the entire cast is great, I really have to give it to the late-great Tom Villard (shown above), who just steals the show here. 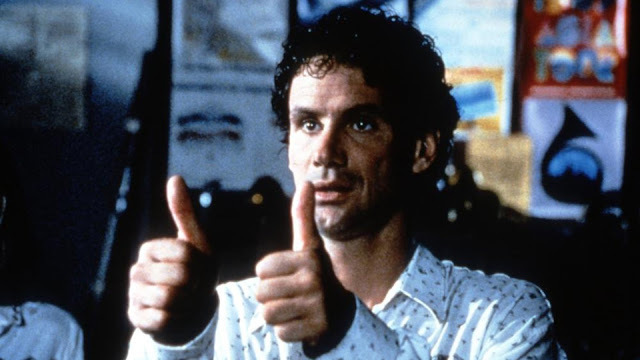 He's an actor I always remember seeing in random things throughout the years, such as a regular on The Golden Girls, one of the Stork twins in the 80's classic One Crazy Summer, and even as a cadet in Heartbreak Ridge. Needless to say seeing him in here was a nice surprise, but his performance will go on as the best in his career. Hands-down. Overall, Popcorn is a blast and such a surprisingly competent and effective horror/comedy that also plays as a homage to classic horror films. The cast is great, the script is strong, and the tone keeps everything in check effectively. For me, this ended up being one of the best times revisiting an old horror film in years and I'm proud to include this one in my collection, because I know it will be one that I will continue to revisit. Synapse films did a bangup job on this restoration, featuring an all new 2K scan of the Archival 35mm Interpositive. The transfer is stunning and looks far better than I anticipated. And let me assure you, it makes a difference. Seeing it in this state is damn near similar to seeing it for the first time on the big screen in it's original 35mm presentation. The colors are bright, the darks deep and the picture is sharp. Synapse did a fantastic job restoring the transfer (the film has never looked better), and the plethora of supplemental material will give you hours of fun to dig through. You can pick up this new All-Region Synapse release from a number of different online retailers, as well as the original Limited Edition Steelbook directly from Synapse Films HERE.